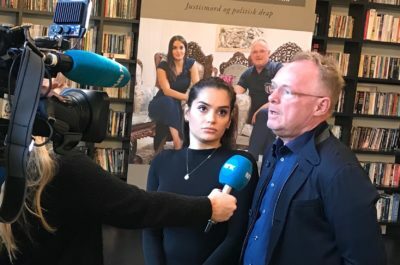 Former Norwegian government minister Per Sandberg shared front-row seats at an Iranian embassy event earlier this year with a Norwegian-Iranian who was ordered held in custody in Denmark on Thursday, charged with espionage and an attempted assassination. Sandberg, who was forced to resign his government posts after violating regulations regarding travel to Iran, remains unrepentant and has published a book that seems to seek revenge. Norwegian Broadcasting (NRK) reported Thursday that a court in Copenhagen ordered the Norwegian-Iranian, who’s been living in Oslo, to be jailed for at least another four weeks, while a police investigation continues. He has not been publicly identified, but has denied all charges against him. Denmark’s police intelligence service PET, however, claims the man has taken part in planning to murder a Danish-Iranian man who leads an Arab nationalist group in Iran, ASMLA (Arab Struggle Movement for the Liberation of Ahwaz). It was implicated in a terrorist attack in Iran in late September. A few days later, the Norwegian-Iranian was observed photographing the home of the ASMLA leader and later arrested in Sweden. NRK, meanwhile, published a photo on Thursday (external link to NRK, in Norwegian) showing Iran’s ambassador to Norway, the alleged assassin and former Norwegian government minister Per Sandberg all sitting in the front row at an embassy-sponsored celebration of the Persian New Year in March. Sitting next to the 58-year-old Sandberg, who was Norway’s acting justice minister at the time, and holding onto his arm is Sandberg’s new Iranian girlfriend and business partner Bahareh Letnes, age 28. She is a former refugee from Iran but has maintained close ties to the country, has competed in beauty pageants as “Miss Iran,” attends Iranian embassy events and traveled to Iran with Sandberg on summer holiday in July. It was that trip that caused major problems for Sandberg, who traveled to Iran when he was still fisheries minister with his government-issued mobile telephone, in violation of security regulations. He also failed to inform the prime minister’s office of his trip to Iran and ultimately had to resign as government minister and as a deputy leader of the conservative Progress Party, after both the government and the party lost confidence in him. Sandberg has since been accused of violating the terms of his government quarantine by traveling back to Iran in connection with his new efforts to launch business ventures between Iran and Norway. On Thursday he told NRK that he and Letnes are aware the alleged assassin was present at the embassy event, “along with many others,” and “we now know who he is.” He said they were checking whether they have had other meetings with him “and forwarded that to the right channels.” He wrote in a text message to NRK that the couple had no further comment. He and Letnes have also released a book that Sandberg hopes will clear Letnes of suspicions that she’s been a spy for Iran herself, and allegedly lured Sandberg into a trap. They reject such accusations and vented their anger in the book over how they’d been treated. “I will use all my time, all my energy and all my resources to give Bahareh the respect she deserves,” Sandberg declared when the book was launched. He lashes out in the book at the media, former party colleagues and opposition politicians. The couple announced, however, that they have dropped plans to sue media including Norwegian Broadcasting (NRK) for allegedly unfair coverage. Critics have bashed the book for focusing so much on their private lives and, not least, on Sandberg’s bitter divorce from another Norwegian politician. She’s accused of tipping both Prime Minister Solberg and Progess Party leader Siv Jensen about Sandberg’s new romantic relationship with an alleged “foreign” agent. Sandberg and Letnes gloss over how Sandberg was a highly public person himself subject to media scrutiny and widely viewed as showing poor judgment regarding his government role. He blames everyone else for his problems, not himself. He hasn’t ruled out trying to mount a political comeback, however. “I aim high and am open for anything,” Sandberg said. It depends on whether his old party, or any other, will be open for him.